A year ago, American whistleblower Edward Snowden took refuge in Russia after leaking to the media classified documents on global surveillance programs that, according to him, the U.S. intelligence services had been running in 60 countries, covering a billion people and 35 governments. But what has changed since the former NSA employee landed in Moscow? It has now been a year since Edward Snowden, a former U.S. secret service employee, arrived in Russia. A system administrator at an NSA center in Hawaii and later a technical specialist with the CIA information department, in May-June 2013, he leaked documents exposing the U.S. secret services' surveillance program monitoring citizens of many countries, including some world leaders, to The Guardian and the Washington Post newspapers. In addition, Snowden revealed information about the secret PRISM electronic data mining program. On June 23, 2013, Snowden, who until then had been hiding from U.S. justice in Hong Kong, landed at Moscow's Sheremetyevo Airport without a Russian visa. According to one theory, a bus was waiting for Snowden on the tarmac, he got out of the plane, got on the bus and the bus took him to an unknown destination. According to another theory, he was taken to a technical staff common room in the airport's transit zone. It was only on July 12, at a meeting with human rights activists, that he announced that he intended to seek political asylum in Russia – though according to the RBK news agency, he submitted an application to that effect to the Russian Foreign Ministry on June 30. On July 16, 2013, Snowden filed an official request for asylum with the Russian Federal Migration Service. That was how Edward Snowden's Russian year began. Moscow's decision to grant Snowden political asylum became an additional source of tension in Russia's relations with the West. However, according to the head of the Petersburgskaya Politika foundation, pundit Mikhail Vinogradov, Russia's involvement in the fate of the fugitive CIA contractor was not a deliberate anti-Western stunt by the Russian authorities: "It was more of a rainy-day fund, something acquired just in case, if relations with the U.S. or the West in general deteriorate." President Vladimir Putin said that Snowden would be granted political asylum in Russia only if he ceased any activities that would be detrimental to, as the president put it, "our American friends.” It appears that meeting that condition was not a problem for Snowden: There have been no more revelations from him. Now all that remains is to sum up the results of his stay in Russia – though whether he stays longer or not remains a matter of guesswork. The political row over Russia’s decision to award Snowden temporary asylum became the formal reason for the cancelation of a meeting between the U.S. and the Russian presidents that was set for September 2013, and led U.S. senator Lindsey Graham to call for a boycott of the Sochi Olympics. Snowden was also shortlisted for the Sakharov Prize for Freedom of Thought set up by the European Parliament, and was even talked of by some as a potential Nobel peace prize laureate. Since he settled in Russia, Snowden has received a job offer to work as a TV presenter and has learnt a bit of Russian. In October, he had a meeting with his father Lonnie Snowden, who visited Moscow for several days. In November, according to lawyer Anatoly Kucherena, who represents his interests, Edward Snowden began working for "a big Russian company.” "His task will be to support and develop a major Russian website," Kucherena told the Interfax news agency. Snowden gives interviews and makes videoconference presentations as an information security and human rights expert and maintains that he considers his mission accomplished because he has won. "All I wanted was for the public to be able to have a say in how they are governed," he told the Washington Post on December 23. "For the Americans, the story with Snowden is a godsend," says author and historian, as well as a chronicler of secret diplomacy, Leonid Mlechin. "Scandals like these make it possible to diagnose the danger and help find ways of treating it. The Americans found out that there was a danger that their rights may be violated and after the scandal with Snowden's revelations, numerous administrative measures have been taken, aimed at improving control over the secret services, including by the public." According to Vinogradov, Snowden got lucky. "He was not a political resource by himself, but he could come in useful if relations deteriorated, as they did – over Ukraine. But that deterioration of relations turned out to be so big that it has eclipsed the Snowden effect, which was losing steam as it is," Vinogradov says, adding that it has saved Snowden from becoming completely marginalized. Snowden has also become something of a literary inspiration since he arrived in Russia. British journalist Luke Harding has written a book called The Snowden Files, while lawyer Anatoly Kucherena used Snowden's story as an inspiration for his novel Time of the Octopus. Meanwhile, in an interview for RIA Novosti news agency on June 10, Kucherena said that he had sold film rights for his book to film director Oliver Stone. The film is expected to be released later this year, Kucherena said. 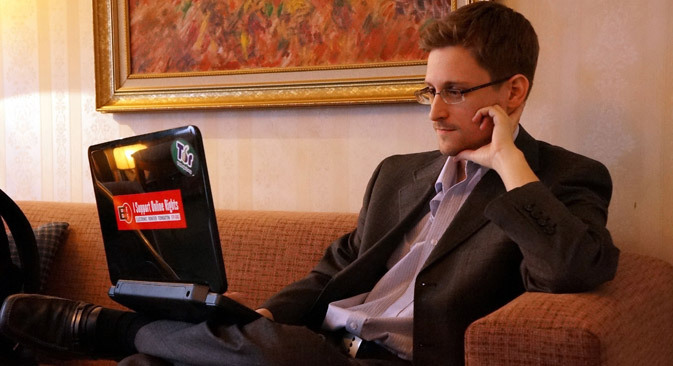 However, Mikhail Vinogradov does not think that Snowden will became a significant cultural phenomenon. He recalls Mathias Rust, a German amateur pilot who became internationally famous in 1987 when, at the age of 18, he landed his light aircraft in Moscow's Red Square. "Snowden too could have made history, but in a year he has not made anything out of the chance he had," Vinogradov concludes.